Polished tangerine with honey hued highlights and a fine yeasty haziness. The top third of the Founders pint glass is filled with an attractive crown of bubbly foam that is aged ivory in color. Cheese grater-like lace is impressively extensive and looks like it will stick around for the duration. Despite being roughly four months of age, the nose on this wet-hopped American pale ale is still pretty aromatic. Sunshine bright citrus juicy top notes are perfectly complemented by a mid-range fruit peel muskiness. Assuming only a single hop was used (which is often the case in beer of this sort), I'll go with Cascade. Harvest Ale is good beer that still has more than a little lupulin life left in it. There is no question that it was more aggressive back in August, but hopheads will still find enough flavor and bitterness for it to be worth their while. Another month and... don't wait that long. Drink whatever bottles are in your possession... right... now! The malt component is slightly toasted and doesn't impinge too awful much on the (still pretty) fresh hop flavor. Citrus fruit rules the day, on the order of lemon, orange and white grapefruit. Simple, straightforward and hopilicious. What's not to like? A gorgeous array of lace earns the appearance score an increase. The mouthfeel is fine for the style. It has just the right amount of heft and contains bubbles that stay in the background, yet tickle the tongue to a minor degree. It's a shame that I wasn't able to experience Harvest Ale immediately after bottling. That said, it has held up remarkably well and is pleasing me to no end this morning. Hoppy beer is a fine way to start the day, spend the day and end the day. Good job Founders. Poured from a 12 FL. OZ. bottle into a pint glass. BOTTLED 09/30/2014. Appearance: Pours a golden body with a thin white head. Smell: Light juicy hop and strong pilsner malt aroma. Taste: Spicy hop flavor. Firm crisp bitterness. Sweet pilsner malts. Mouthfeel: Medium to light body, sharp bitter aftertaste. Overall: Not at all what I was expecting. I was expecting a much juicier, tropical/citrus hop bomb. Bitterness is high, but body is light and crisp. Non of the classic ale fruitiness. If you told me this was a continental pilsner, I would have believed you. In Laurel. Bottle on date of 09/20/17, so that was a half year ago. Pours a slightly less than clear pale straw yellow with an abundant snowy white head that has superior retention. AROMA: Citrus rind, along with some mild hops- apparently at a half year the since bottling their strength has been compromised. TASTE: Malts, (toasty bread). are more prominent. Has good balance but suppose the hops have faded. Bottle to goblet. Aroma is pine, hops, citrus. Look is pale yellow, small white head, fades. Taste is a bit soapy, with some pine, some citrus. Ok...well...starts off ok, but it wears thin on you. A: [4.50] Very transparent straw colored beer. The beer forms a 1/2 finger of white head. The head has some linger to it. The bottle lists the ABV(7.6%) and there is a born on date of (09/30/15). S: [3.75] Grassy and piney. T: [3.50] Starts with a resinous pine flavor. Leads into some nice malt sweetness in the middle. M: [3.50] The mouthfeel is very dry, like a dry wine. The finish is relatively short continuing the dry theme. O: [3.75] This is a decent beer but nothing stands out. The flavor is solid and drinkable but I expected more. More, bitter, more citrus, more pine - more something. That goes for the nose and the taste. I have had beers with 2% less ABV and more flavor and complexity. This is still a decent beer - it is just not knocking my socks off. BOTTLE: 12 fl oz. Brown glass bottle. Black branded pry-off crown cap. Generally appealing label art. Bottled 09/30/15. 7.60% ABV. 70 IBUs. Served cold into a pilsner glass. Expectations are above average given the brewery. HEAD: 2.5cm wide. White colour. Average thickness and frothiness. Not real creamy or robust. Leaves no lacing as it recedes. Retention is above average - about 3 minutes. BODY: Clear copper of average vibrance. Clean and clear, obviously filtered. I see no yeast or sediment. Appears adequately carbonated. Not unique or special. Has no stand-out characteristics. AROMA: Has a fresh floral hop profile over a pale malt base. Pleasant hints of pine and hop oil. Not resinous, juicy, or overtly fruity. Though the aroma as a whole is muted and reticent, it suggests a balanced beer with some nice elements. No yeast character, booze, or off-notes are/is visible. TASTE: Follows the aroma, with more pale malt sweetness than anticipated. It's not caramalt-heavy, luckily, but it is too forward in terms of malts, casting the hop profile in shadow. Hop notes include floral, lightly piney, slighty resinous, and vaguely fruity. Somewhat imbalanced, and not quite dialed in. Not gestalt, but it's cohesive enough - albeit rough around the edges. Average depth, duration, and intensity of flavour. I do like it, but there's ample room for improved intricacy, subtlety, and nuance. TEXTURE: Slightly oily. Overcarbonated. Smooth, wet, medium-bodied, and of average heft and weight on the palate. Not too sticky or syrupy. Not chewy. This texture complements the flavour profile decently, and fits the style. But it doesn't accentuate specific notes or elevate the beer as a whole. Not gushed, hot, boozy, astringent, harsh, rough, or scratchy. Well executed for the most part. OVERALL: It's a nice IPA for what it is, but like many Founders beers, it falls short of the best beers in the style from across the country. Though it fails to compete even with down-the-interstate neighbors Bells Brewing's offerings in the style, it's well worth trying once. I'll enjoy finishing it, but it won't impress discerning drinkers. Drinkable, and it hides its ABV well. Certainly above average. APPEARANCE: Head is 3 fingers in height and white in colour. Soft and supple. Boasts nice froth, creaminess, and thickness. Even light lacing adheres to the sides of the glass as the head recedes. Head retention is quite good (~8-9 minutes). BODY: Clear copper-gold of good vibrance. No yeast or sediment can be seen within. Translucent. Transparent. Appears well-carbonated. A good looking IPA. AROMA: Fresh citrus, juicy fruity hops, orange citrus, floral hops, zest, faint grapefruit. Fresh. Pale malts lend balancing sweetness. Light and pleasant. Quite appealing for a fresh hop IPA. Aromatic intensity is mild. I detect no overt yeast aromatics, off-notes, or booze. TASTE: Fresh floral and citrusy notes. Citrus zest. Light-as-a-cloud pale malts give this its gentle backbone. A hint of honey. Faint nectary hop flavour. Balanced and enjoyable, if a bit low in flavour intensity. Flavour duration is average. Good depth of flavour. Very drinkable. Simple but effective. Boasts a cohesive build. Its balance is the highlight of it for me; the hop bitterness is well tamed by the mellow pale malt sweetness. TEXTURE: Smooth, wet, delightfully light-bodied, refreshing as hell, soft, supple, perfectly carbonated. Great mouthfeel for an IPA. Complements the taste rather well, with the light body accentuating the gentle pale malt backbone. OVERALL: Damn easy to drink for a 7.60% ABV brew. Another very good ale from Founders. 12oz brown bottle, no freshness date. Bright golden glow in the light, faint hop haze. Bubbly lacing certainly suffices and then some. Blond tobacco, hemp seed oil, soft pint, cilantro and mint show the hops in an epic proportion for the aroma. Hey malt, how hay doing? Thanks for the bready and biscuity flavors but now you can move aside for what I really want. Fresh hop flavor, thanks. Stodgy oily hop chaos grips the taste buds. Bitterness is not scathing but pricks the tongue enough times to be noticed. Flash of shortbread from the malt but then a whole lot of hop flavor pushes in. Hoppy semi-dry finish. Great example for someone to try a fresh hopped ale, balanced and drinkable. Complex yet easy to quaff back. Great to finally try this beer,poured into a standard pint glass a hazed light golden with a frothy one finger white head.Awesome aromas of you guessed it fresh citric and and piney hop with a touch of sweetish biscuit.Fresh hops jump on the palate,fresh grapefruit and lemon pith with underlying pine needle,a firm slightly sweet malt base is there as well keeping everything in tune.Man I love this brew its fresh hop taste is awesome,my fridge beer for the time being. 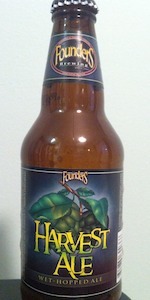 Founders Hop Harvest pours a clear, golden yellow with a small frothy white head on top. The foam disappears quickly leaving only a few spots of lace on the glass. The aroma is more subdued than I thought it would be. Notes of orange citrus, light fruit and some bready malt are all detected. Each sip of this light to medium bodied beer is slick on the palate with mild carbonation. The flavor is nicely balanced between biscuit malt and citrus hops. Some orange citrus and lemon rind are followed by a touch of light fruit and sweet bready malt. It finishes slightly grassy and mildly bitter. Once gone the grassy bitterness lingers on the palate. This is a very easy to drink beer, but not as hoppy as I hoped it would be. Clear light golden color with a white head. Aromas of citrus peels and oils and some light herbals. Flavor is much the same with some medicinal alcoholic hoppy notes that are not too intense. I like medicine. Medium body and finishes like a summer camp memory. Pours a bright golden color with minimal head but nice lacing. Very fruity to the nose; orange, lemon, melon with a hint of pine from the hops. Immediate blast of fruit in the mouth; orange, grapefruit, melon, white grape. The fruit is coupled with an astringent forest leafiness, green tea and a slight buttery finish. Smooth, dry in the mouth. Very tasty offering, very drinkable. If these characteristics are common to wet-hop ales, I'll be seeking these out regularly in the autumn. 12 oz bottle created on 10/1/15 poured into an IPA glass. A - Two finger, creamy head that retains well. Crystal clear gold, with active carbonation visible. S - Fresh hops indeed. Heavy pine, grass. T - Front end pine, citrus, and some light toasted grain/malt presence. M - Carbonation medium low, slightly creamy, bitterness is a factor. O - A very tasty wet hop IPA, and I am glad to come across some this year before it disappeared. The appearance is a mild orange and when poured into a snifter is a beautiful sight. Not a great deal of head and what head there was disappeared quickly. The aroma is fantastic. I've never been to a hop farm but I imagine this is what it would smell like. Herbaceous character with hints of pine and citrus. This is an interesting offering - I get some sweet action on the tip of the tongue but finishes bitterly. I love it! Overall this is a great beer. Very nice! Glowing gold but capped with a finger of snow white head that clings to the rim of the glass. Not quite as exciting to look at as I remember, too cold though I think. Thick syrupy citrus aromas, fresh hops, bittersweet abundance of mild grapefruit and orange peel. Some more tropical notes are apparent beneath that. A surprisingly decent caramel malt backbone as well. Sharp citric hop bite up front - the sweet malt character plays well up against a distinctly fruity hop profile, finish is appropriately bitter - not too wet, not too dry. Simple beauty. Yet another delicious beer from our friends at Founders.